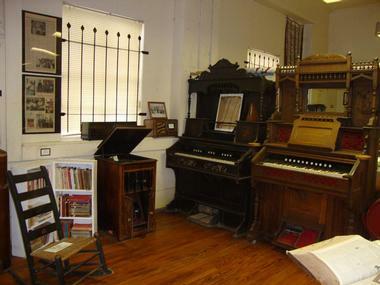 The town of Mountain View, Arkansas is famous for preserving the traditional music and folkways of the state, with the Ozark Folk Center State Park as one of its main attractions. Along with music, the town is offers antique shops, music stores, outdoor recreational activities, and numerous delicious dining options. Situated within the Ozark National Forest, the Blanchard Springs Recreation Area is a good place to start with any adventure in the Ozarks. 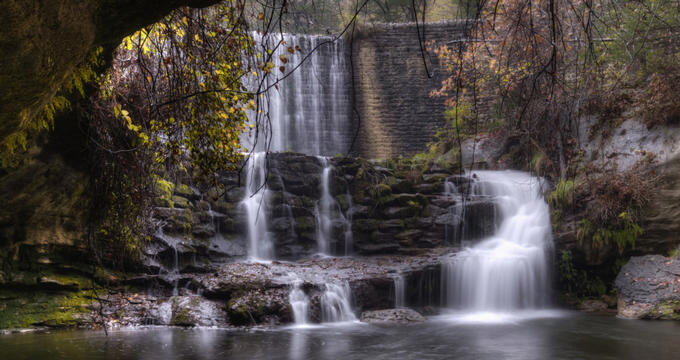 The scenic Ozark Mountains are well known for their clear streams, waterfalls, hidden caverns, and rolling hills. The facilities of the recreation area are located near crystal clear streams and picturesque rock bluffs, and the various sites are shaded well by stately pine trees. Mirror Lake offers excellent opportunities for trout fishing, and other recreational activities can be found here as well, such as swimming, hiking, and mountain biking. 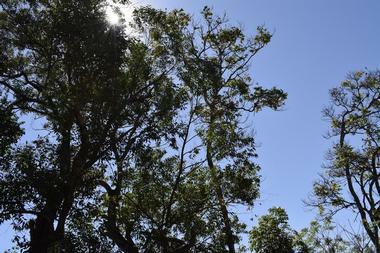 The campgrounds on site provide various types of campsites. The Ozark Folk Center State Park is a one-of-a-kind park in the United States, and the only park dedicated to the culture, craft, and music of the Ozarks. Located in the world’s “Folk Music Capital,” the park provides visitors with a rare chance to watch several artisans at work, listen to music playing through the hills, and walk among herb gardens. The Ozark Folk Center is typically open beginning the middle of April until the middle of November, with features such as the Craft Village in which guests can see numerous artisans working to create things like baskets, iron work, pottery, and more. Loco Ropes, located in the Ozark Folk Center State Park in Mountain View, offers a state-of-the-art experience in treetop adventure. Mountain View is has been named one of the country’s “50 Great Adventure Towns” by National Geographic Adventure Magazine, so it of course makes sense for the town ot have an adventurous treetop rope course. Loco Ropes features three different rope segments that together have a total of over thirty challenges designed to test the strength, agility, endurance, and nerve of those who dare to take them on. 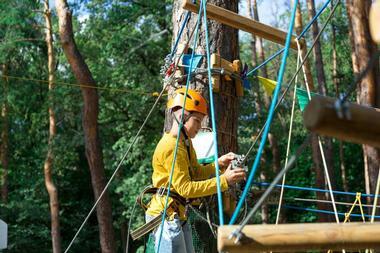 The treetop park provides fun for the entire family. The OK Trading Post of Mountain View offers a unique outdoor experience for anyone who loves the great outdoors and animals. The site provides horseback rides along scenic mountain trails for nearly any sized group and any occasion, as well as overnight camping trips. Trail rides include scenic views of the Ozarks and natural forest. Guests will travel through the scenic forest and along a creek while viewing overlooks with amazing views. There is also a gift shop and a petting zoo at the OK Trading Post. The petting zoo includes goats, sheeps, donkeys, rabbits, deer, and more. The Stone County Museum in Mountain View, Arkansas is open to the public from the middle of April until the end of the month of October. Volunteers typically have the museum open from one until four in the afternoon on Thursdays, Fridays, and Saturdays. It’s usually advised that visitors coming visiting the museum from out-of-town should call in advance to make sure there will be a volunteer present to assist them. The museum is owned and operated by the Stone County Historical Society, an organization that aims to preserve the history of the people who settled the north-central area of Arkansas. The Peace Pole of Mountain View was designed and made to be reflective of the wishes of those who live in the Ozarks. They with that the phrase of “May Peace Prevail on Earth” will one day become a reality. The pole itself, stone seating, and the paving were all made by stone quarried from the Stone County area. Nearly every bit of work that went into building the Peace Pol was done by citizens of Stone County. The languages used in the landmark to display the phrase “May Peace Prevail On Earth ” were selected to reflect the region’s early inhabitants. 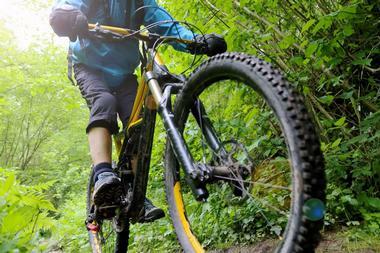 The Syllamo Mountain Bike Trail is a network of interconnecting trail loops that provide enthusiasts of mountain biking with approximately fifty miles of mountain bike trail, with much of the trail being single-track. 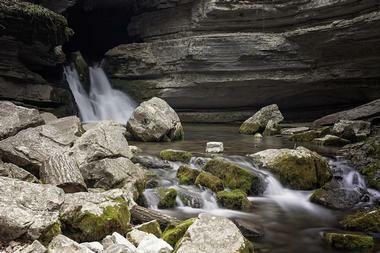 The different loops can be reached from four trailheads in the area, along with the Blanchard Springs Recreation Area. Three of the trailheads can be accessed from Green Mountain Road, while the fourth trailhead is located along AR Highway 5 North. Difficulty along several sections of the trail have various levels of difficulty, ranging from beginner to extreme, during which beginners are recommended to walk their bike. At Jack’s Fishing Resort, the owners, Mary and Jack, offer many different amenities for visitors to enjoy at their resort. Guests can spend their stay visiting the many attractions in the area, rafting down the river, or fishing for trout. In the evenings, visitors can have a delicious meal at Jojo’s Catfish Wharf before they call it a night in their spacious guest room, several of which offer river views from the screened porch. All guest rooms feature cable television, as well as kitchenettes upon request. 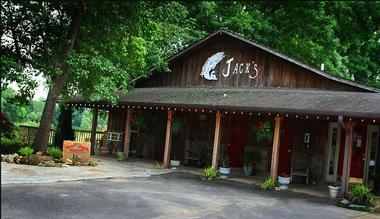 Jack’s Fishing Resort also includes an RV park with bathhouse, and a Bar-B-Que Pavilion. Tommy’s Famous in Mountain View, Arkansas serves a large menu that includes baby-back ribs, barbecue, calzones, and pizzas. The “Tommy’s Dry Tavern” dining room provides a candelit setting and a bluesy atmosphere. Customers can have a seat at the bar and enjoy one of the area’s best selections of imported and domestic non-alcoholic beer. The bar also boasts a wide view of the restaurant’s kitchen, where they can watch pizza dough flying in the air. All of the food is fresh and prepared from scratch. Tommy’s Famous has been a family owned and operated restaurant in the community since 1991. The Anglers White River Resort Restaurant, as the name suggests, is located at the Anglers White River Resort in Mountain View, Arkansas. The restaurant provides nearly everything visitors may look for in a great dining experience. The Anglers Restaurant consists of a spacious dining room and a dining patio overlooking the scenic White River, strives to make guests feel right at home through delicious food, exception service, views of the river, and the ideal stop to take in the local culture. Menu items include steak, seafood, pasta, chicken, burgers, sandwiches, and more. Anglers is situated around ten minutes from the town square. Mikey's Smoked Meats and Deli provides a wide assortment of cheese and freshly smoked meats that are prepared on site. The eatery is located just minutes away from the Ozark National Forest and the White River in the scenic Ozark Mountains of north-central Arkansas. Hickory-smoked barbecue is prepared in a true wood-burning pit. This method of slow cooking requires more attention and time, providing a much better flavor to the meats. The most popular items at Mikey’s Smoked Meats and Deli is the lean, hand-trimmed Cherry Wood Smoked Beef Brisket. Baby-back ribs and whole chicken are on the menu as well.